KUCHING: The tenure of land lease, after conversion or sub division, will be maintained as the government is encouraging realty development in the state. 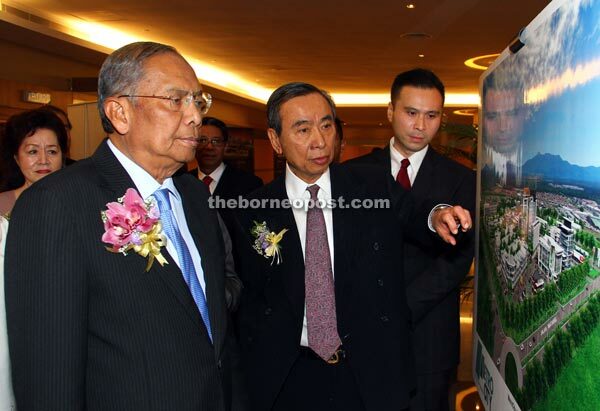 Adenan listens to a briefing by Chong (centre) on the facilities available at MetroCity Square. The Square is part of Metrocity Matang New Township project. Adenan prepares to sign a plaque to commemorate the launching of MetroCity Square. Looking on is Chong (left). Chief Minister Datuk Patinggi Tan Sri Adenan Satem said the lease period will remain unchanged - meaning a land with perpetuity title will still have a lease of 999 years and a 99-year lease will remain so. Adenan has been looking at the idea of AVTC (Arbitration for Valuation of Titled Condition) for sub-division of land to maintain the leasehold period and have a more liberal policy on land matters. "In respect to the general policy of the government on realty development, we have decided not to change the tenure of land leasing period. If the period is 999 years, the conversion would remain 999 years. If it is 99 years, it will be converted to 99 years. "No change, this is to encourage realty development," he said when officiating at the official launching of MetroCity Square (MetroCity Matang New Township) and signing ceremony between CKH Realty and Boulevard Group of Companies at Imperial Hotel here yesterday. Also present were CKH Realty chairman and managing director Chong Kia Hoi, Shin Yang and the Boulevard Group of Companies chairman and chief executive officer Tan Sri Ling Chiong Ho, Assistant Infrastructure Development Minister Datuk Daud Abdul Rahman, state secretary Tan Sri Datuk Amar Morshidi Ghani and Datuk Bandar of Kuching North Datuk Abang Wahap Abang Julai. The amendment to the state`s land policy in the past regarding conversion, sub-division and renewal had created discontentment and confusion among the people. One of the problems was that landowners of freehold or 999-year land lease found their land being reduced to either 99 or 60-year leases after conversion. In addition, Adenan mentioned that the government was currently in negotiation with Sesco to reduce the amount of capital contribution. He hoped that the discussion would be successful. 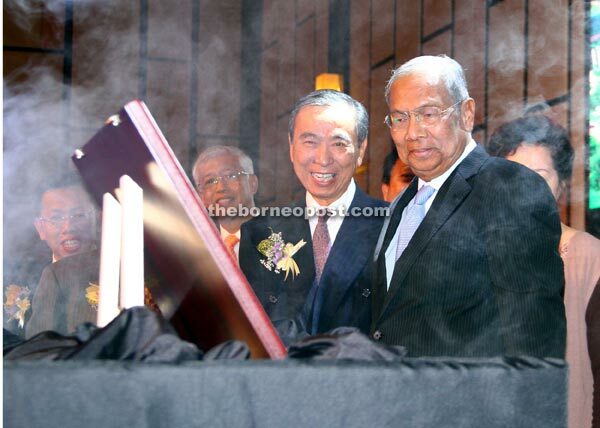 Touching on the RM250-million MetroCity Square, the chief minister pointed out that CKH was not only building a row of shophouses, but a part of a modern city with a liveable environment that will become a central business district for the north Kuching region. The square will feature 356 units of SoHo apartments, 71 units of strata-titled boutique shops, an eight storey corporate office tower, 32 units of commercial shop offices and integrated multi-storey carpark with 582 bays. In regards to the MetroCity integrated township development along Jalan Matang Lama, he said: "It is a brave venture. CKH is building a nucleus for economic development in the area, which will spread out further. It will increase employment, generate and attract more businesses. "MetroCity enables Matang to become a public transportation centre and education hub. I will not be surprised if Matang becomes an economic engine of the Kuching northern region." MetroCity`s commercial precinct comprises commercial mall, private medical centre, a four-storey hotel, integrated bus terminal, a higher learning institute, petrol stations and fast food restaurants including one with a 24-hour drive through. At the ceremony, CKH made contributions amounting to RM150,000 to seven charitable organisations.